Are we all going to kill Humaam? Mamma, how can you kill a man to show the world that killing is unacceptable? This is what my 14 year old daughter asked me today. I am so grateful that there is still so much innocence and, so, hope for new generations to come. It is as simple as she put it. Although the penalty existed, a 62 year unofficial moratorium on the death penalty in the Maldives was lifted in 2014 with the enforcement of the Regulation on the Implementation of the Death Penalty. We now have a list of 17 people on death row since 2008, and a few of them sentenced as minors. The government of Maldives has in the past year justified MVR 4 million (US$ 261,547) to build a death chamber at the prison island. After having tried and failed to procure the serum for lethal injection, the government has quickly fixed this problem, choosing instead to implement the sentence by hanging until dead. Out of the death row inmates, 23 year old Hussain Humaam has his case at the Supreme Court at present. Although not the first to be sentenced to death, he would be the first to be confirmed, if not acquitted by the Supreme Court. While all the death sentences were passed based primarily on confessions rather than evidence, what is most interesting in Humaam’s case is that his sentence is based on a statement given out of trial, during a remand hearing. It is also one of three different statements, contradicting each other, that he gave at the Criminal Court of Maldives. Let us not even go into the legitimacy of these statements when Islamic Shari’a and the law both require proof beyond any doubt as opposed to reasonable doubt, in the case of an accusation of murder. Article 52 of the Constitution states that a statement given in police custody, if contradicted at trial, cannot be used to convict the defendant. Humaam is a notorious delinquent since childhood; a boy who was involved in all types of crimes from theft to street fights to stabbing, and now murder. Is this why many of us have turned a blind eye to what is going on with this young man who the State will very likely put to death, despite the many flaws in the judicial process? Penalties should absolutely apply to offenders, and it is also in the interest of the society. However it is not in the interest of anyone when the law is twisted far enough to take the life of an individual without due process. Neither the process nor the interpretations used conform to best practice or our international obligations. An individual is part of the society. It is all these individuals, including the businessmen and women, the lawyers, the judges, mothers, fathers, our children and yes, the criminals and delinquents who make up a society. The Criminal Court deemed it necessary that a death sentence be passed on Humaam “in the interest of the harmony of the society” despite that fact that Islamic Shari’a requires ALL of the victim’s heirs to ask for it. The victim in this case left behind two children who are still minors, unable to state their wish until they turn eighteen. The Criminal Court deemed it necessary to not wait for these children to turn eighteen, as the Maalikee sect in Islam prescribes in such cases. I wonder why there is such an urgency to take this young man’s life. Furthermore, why would the court use Maalikee sect when the general principle in criminal law is that in a situation of conflict of law or principle, whichever law that is most lenient to the defendant should be used. This has also been the practice in the Maldives in many cases – yet we do not see this principle followed in the case of Humaam, and upholding this death sentence by the Criminal Court seem to have become crucial at many levels. I also wonder how many of us think about the gravity of this problem, with the State killing a man through a process that has breached the principles of Islamic Shari’a, common law, international obligations and even common sense. All of us who righteously speak of injustices, of a flawed justice system, inequalities, protection, prevention and so forth. Why do we not raise our voices against this atrocity? I cannot believe that we have failed the morality and values that our ancestors, and Islam itself, have left in us. It does not matter whether Humaam was ‘a good boy’. What matters is whether justice has been served, whether due process has been observed. Whether we treated Humaam fairly enough, such that if someone of our own (family) was accused of the same crime, we would have treated that person the same way. Humaam’s lawyer, Usthaz Haseen, raised the question of Humaam’s mental condition at the Criminal Court, citing family statements that Humaam has had episodes where he was not mentally fit. What was the court’s response? That a claim for insanity could not be accepted since Humaam had previously faced many charges and never once claimed insanity till now. Dear court, there is no time set in stone as to when a man can lose his mind. The court also said that Humaam’s lawyer could not prove to the court that Humaam had a psychiatric problem. That is right. Humaam’s lawyer could not because he is a lawyer. Not a psychiatrist. The court then decided that Humaam was of sound mind. The court itself, not a psychiatrist. The next question is whether Humaam’s defense attempted to ascertain his frame of mind. 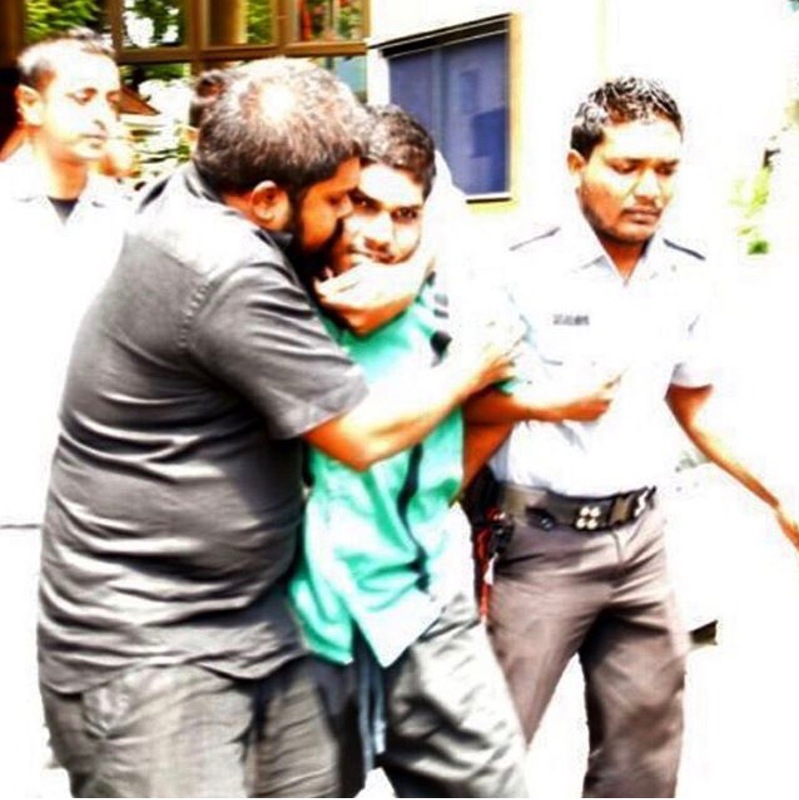 Humaam was arrested on the night of October 20, 2012 and was in police custody until he was sentenced. Any medical or psychiatric evaluation that was conducted on him, was conducted by the police, by a medical professional of their choice. None of the medical records are shared with family. As with every person who is under police custody in the Maldives, no one will believe what those documents say, and insist on an evaluation by an independent medical professional or one of their choosing. Then again, it would be far-fetched to expect the judiciary or the state to provide an evaluation of Humaam by a psychiatrist that the family is happy with, and also for it to allow the family to have access to the medical reports. In the case of Ford vs Wainwright in Florida (1974), the United States Supreme Court allowed for a review to clarify, among other issues, whether the district court should have held a hearing on Ford’s claim of insanity. The court “found that three problems with the procedures followed in Ford’s case: he had no chance to provide evidence relevant to his sanity, he was denied the opportunity to ‘challenge or impeach the state-appointed psychiatrists’ opinions,’ and the procedure placed the ultimate decision wholly within the executive branch. The Court found that Florida’s inadequate procedure denied Ford his constitutional right to due process. Accordingly, Ford was entitled to a new evidentiary hearing in federal district court on the question of his competence to be executed” writes Capital Punishment in Context, a resource platform for cases involving capital punishment. The report of the Criminal Court repeatedly refers to the fact that Humaam was not consistent in what he said at the hearings. The court could not rely on his statements alone, so they rely on statements made by others. In legal jargon, hearsay. It also refers to Humaam’s self-proclamation that he had previously been involved in several heinous crimes. Again, it is a general principle in criminal law that, an assumption cannot be made for culpability based on the fact that one had previously committed a crime. Begging once again the question why the court could have declared him of sound mind then. Is it not natural for one to think the young man must be quite mad to be admitting to all these crimes when at the same time he is denying similar charges? Humaam has since attempted to end his own life and to harm himself in prison several times, at times requiring minor surgery. He speaks of a man in white entering the solitary confinement cell he has lived in for the past three years, of voices he hears deep into the night and of nightmares. The case screams for a psychiatric evaluation, yet none of the authorities or courts have had the decency to speak of it. Does the law allow for an insane man to be executed? Does Islam allow for it? I believe not. Will the Supreme Court allow for an independent evaluation of Humaam’s mental condition? In the case of Abdul Awkal in Ohio (2012), the Supreme Court indefinitely stayed his execution based on the county court’s ruling that Awkal was mentally incompetent for execution following a mental competency hearing. In the case of Robert James Acremant in Oregon (2011), a death sentence was commuted to life imprisonment without parole with the exception of new evidence showing Acrament feigned mental illness. In the case of Isaac Jackson Stroud in California (2011), his sentence was commuted to life imprisonment without parole based on an incurable mental disorder. The list goes on. It depends on whether the Supreme Court will consider the reality of mental illness in the case of violent offenders. It also makes me cringe at the state of rehabilitation and care available for the mentally ill in the Maldives. A bigger question for me is, will our society allow for an independent evaluation of Humaam’s mental condition? Are we, as a society, not satisfied enough to try and rehabilitate the outcasts within us? Or are we as a society too, hungry to take this man’s life, any life, believing that it will right the wrongs? Will we kill and do away with a chunk of our society to call it clean? Killing a man will not bring back the dead. It will not prevent anyone else from killing again – for if it were a deterrent, then the world will have stopped murdering people for hundreds of years now. More cases of death sentences have been scheduled at the High Court as we read this. The rush at which a State will go for an individual’s life is no worse than hearing of a gang of thugs planning to kill a man. One simple question. Prophet Mohamed SAW says, our Eeman will not be complete until we want that which we want for ourselves, for our brothers too. If Humaam was your own brother, would you believe that the court system is fair enough to warrant the taking of his life? Would we believe that the process he has gone through was fair enough? About the author: Shahindha Ismail is the Executive Director at Maldivian Democracy Network. Shahindha has been working in fields related to human rights for ten years, and is the co-author of the MDN publication: Asaasee Haqquthakaai Minivankan [Fundamental Rights and Freedoms]. She has also contributed several articles and reports to human rights journals. She is a keen runner, and is married with one daughter. This reads like an emotional opinion essay. Perhaps this specific trial itself is extremely unfair. That does nothing to change the validity of the death penalty. Funny how the rights of the criminal seem to be more important than that of the victim. You quote Hadith once in a while only to contradict it later by saying that the death penalty should be obsolete. It’s an established fact that a society such as ours where criminals go unpunished, is not a very good one in terms of upholding the law. A man/woman who has killed another deserves the same for himself/herself. The same way the victim of a robbery deserves compensation to cover the losses, the same goes in the case of murder provided the conditions specified in the Shari’ah are met. I notice how instead of saying the thief deserves to have his hand cut off you stated that the robbed should be compensated. Im glad. The fact that even you realize how barbaric and ridiculous this is, is why you’re squeamish and avoided it. (perhaps I give you too much credit.) And It is precisely for this reason that most muslim countries dont instate this punishment, because the people atleast on a subconscious level realize how inhumane it is. what does a life sentence in jail achieve? you isolate him from society, and make sure he can never kill again. What does the death penalty do? ; exactly the same thing. (there are brilliant incarceration programs where lifers are put into labor programs; effectively working towards the betterment of the community with work, and personally I think the death penalty is too lenient a punishment for someone who takes a human life) And calling out for blood and actually wanting someone’s head to roll is not only illogical and absurd while these alternatives exist where you can get more out of the convict that helps society as a whole, its animalistic. Following is an english translation of the average mordisian monkey’s thoughts on Humaam being killed. And an english translation of off-the-record courtroom communications. Violence in the Maldivian family: why does it continue to breed despite the Domestic Violence Prevention Act?